The main reason most homeowners in Vancouver love using stained concrete is that it transforms the bland grey surface into a vibrant textured surface. You can be the envy of all your neighbors by adding some flair to your sidewalks and driveways. We can colour the concrete almost any shade you want with a liquid dye that is added at the concrete plant and mixed into the load. Have an idea for a colour but not sure what it’s called? Give us a call and well bring you a color code book. You can choose from a variety of colours and textures to have your driveway, patio or sidewalk looking great. -Adds character to your home. 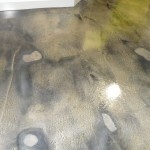 Generally there are two different methods to achieve stained concrete. Existing slabs may be stained or fresh concrete may be stained with a selection of original designs for added appeal. There are reactive and non-reactive methods of producing extraordinary beauty to stained concrete. In a non-reactive method, stain is applied to the concrete surface. There is no chemical reaction, so the application of stain sticks to the concrete, loading its pores with dye particles and penetrating the stain into the concrete. Shades of the non-reactive approach are of an opaque or solid result, and the options for colors are numerous. With the reactive method, water-based acidic solutions are blended and applied to the patio or floors surface in order to attain stained concrete. The solution contains metallic sodium that react with the content of lime in the cement, causing a permanent bond. By using this reactive method to stain concrete, you will be certain that there won’t be crumbling or chipping off of layers, since it is embedded within the make-up of the concrete. Colours of the reactive method are translucent and earthy. Acid-staining gives rich colours of varied looks, most commonly referred to as marbled. Stained concrete is admired both indoor and outdoor as well as on walls. 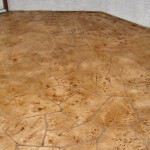 We offer stained concrete for patios, driveways, walkways, steps, entryways, sidewalks, pool decks, and much more. Every stained concrete project is a work of art. We provide a wide variety of stained concrete colours, including two-tone antique special effects. 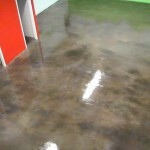 Imagine how stained concrete would transform the look of your home or business. 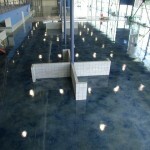 Routine maintenance of stained concrete is marginal. We suggests cleaning stained concrete with a mild soap and hosing it off. Seal the stained concrete once a year with a roller connected to a full length extension. We can arrange this service for you or give you clear instructions on how to do it yourself.